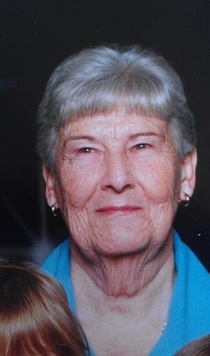 Obituary for Mary Ruth (Benzley) Session | Crandall Funeral Home Inc.
Mary Ruth Sessions passed away on February 9, 2019 with her family around her in Casper, Wyoming, she was 91. She was born on September 5, 1927 in Evanston, Wyoming to Dewey Benzley and Leah Goddard (Harris) Benzley. She graduated from Evanston High School. She was a member of the Church of Jesus Christ of Latter Day Saints. She married Glenn Allen Sessions of Evanston on January 24, 1947 and they had a son Ronald ‘Ron’ Glenn Sessions on August 29, 1951. She is survived by her grandchildren: Yvonne Marie Fairbanks of Casper, WY, Justin Glenn Sessions of Battle Mountain, NV. She is also survived by her daughter in law Vicky Sessions of Casper, WY and her great grandchildren Michaela and Alexis of Casper, WY. Mary is preceded in death by her husband Glenn and their son, Ronald Glenn Sessions. A graveside service will be held on Friday, February 15, 2019 at 11:00 a.m. in the Evanston Cemetery. Family and friends will gather at the Crandall Funeral Home, 800 Uinta Street, for viewing from 10:00 to 10:45. In lieu of flowers memorials can be made to St. Jude Memorial Hospital in memory of Mary, as she donated to this cause and believed in their mission to save all children suffering from cancer.